Model T Ford Forum: Best grease for u joint? Best grease for u joint? Model T Ford Forum: Forum 2014: Best grease for u joint? It's a Model T. There is probably no "best" grease, virtually any name brand is fine. I would avoid any grease that contains graphite. My personal favorite is Mobil 28, simply because I get large quantities for free when the shelf life expires. 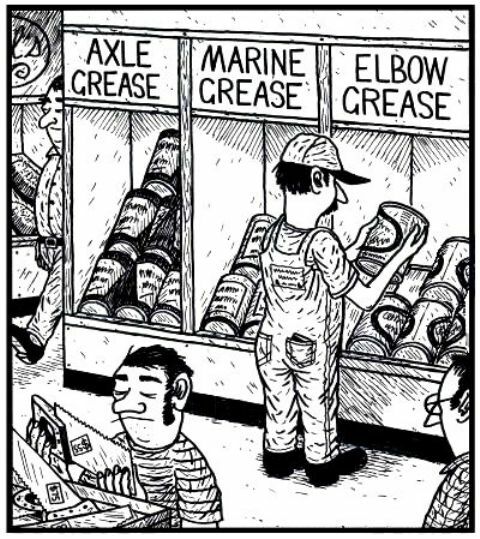 How about this then: If I were to buy one tub of cheap, available grease to use on everything but the diff, what would I be looking for? Click here - any of these that do not have graphite would be fine. You are looking for wheel bearing grease. Real Model T experts use only the appropriate period correct lubricants. Your U-joint demands Tracto. I use red wheel bearing grease on the front wheel bearings and a grease cartridge from Tractor Supply for everything else. I have replaced all the grease cups with Zerk fittings. As Royce indicated, any modern grease should be fine. Avoid old fashioned fiber greases as they have poor water resistance. I use marine wheel bearing grease in mine. Actually, I use it in just about everything that needs grease, and always have. No problems, and it saves me from having multiple containers of grease laying around. Maybe the best for the T u-joint would be CV joint grease, but any chassis or non-fiber wheel bearing grease will do the job. Motor oil or gear oil would be good but you can't keep it in there, that's why I use CV joint grease when the engine or rear end is out. CV joint grease is light enough to run into the joint when stopped but not light enough to run out of the U-joint ball when stopped. All parts stores have it, it comes in a plastic envelope. Cheap. I use a synthetic grease by Hydrotex, it is called Parasyn 70. It is about 3 times the cost of most other greases, but I am sold on it. We used to have an articulated Allis Chalmers tractor, and the service interval for the CV joints in the hinge was 8 hours, we had to grease them every 4 hours or they would get noisy. I switched to the Parasyn and could go the full 8 hours with out problem, I once skipped a service of the CV joints to see how long the grease would last and the joints were still quiet at 16 hours. Regular chassis grease. I would tend to think wheel bearing grease would be too thick and wouldn't do much. Good wheel bearing or chassis grease. Be sure that it does NOT contain any graphite or molybdnm which will stick to magnets and can conduct electricity, possibly interfere with the magneto if some of the grease makes it into the oil in the transmission. Yes it can get into the transmission. The grease cup puts the grease under pressure and it can force it into the transmission. Regular grease will be thinned by the oil and cause no problems. Aaron, I may be wrong but from the CV joint grease that I used, I thought it had a lot of graphite in it? Where grease is concerned, sticking with whichever brand and type you're already using may be a good idea. When I switched from one brand of red grease to another, the chemical reaction of combining them thinned the grease's viscosity to that of a medium-weight oil which dripped and flowed out of everywhere and got all over my brake shoes and drums. Even my grease-gun leaked out of every joint and seal. For a newbie like me, taking the rear axle apart to properly repack the Hyatt bearings with grease was too problematic to tackle. For that job, I have neither the knowledge nor knack. The poor answer to my problem was to stuff the living daylights out of the grease cups with enough fresh grease to purge the bad stuff and hope enough good stuff got to where it was needed. In other words, I'm good at fooling myself. Learn from one of of the know-nothing newbie's many mistakes. Whatever grease you've been using�as long as the stuff contains no metallic components like graphite, which can harm your magneto�keep using it. Ken may be right about the graphite, but if it's good for CV joints I would think it'd be good for U-joints.? I use the Timken bearing grease from the suppliers. It's the best I've seen yet. What really matters is frequent use of any good non graphite grease. Don't bother chasing grease that's hard to find or really expensive. I was thinking some more about that CV joint grease and wondered if maybe it's not graphite in there at all, but maybe molybdenum disulphide? Which is also carbon based.